Welcome to the final update to Euphorius. While we contemplate how we’re going to top ourselves for Shrive, feel free to conclude your dusk-till-dawn partying in the desert with eight new songs, and a ton of other patches (including newly-added videos for six other songs). 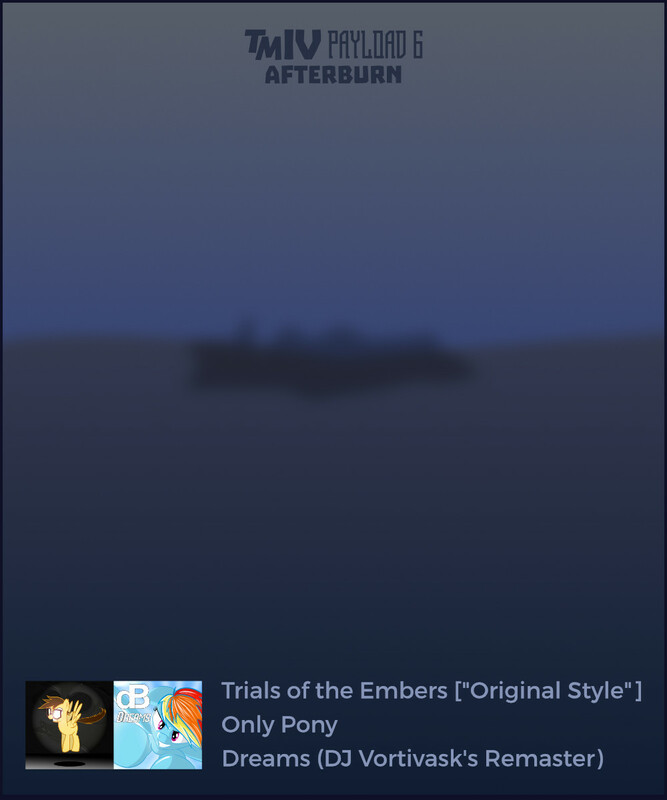 “Dreams (DJ Vortivask’s Remaster)” and “Only Pony” make their official debut in Payload 6, alongside the “Original Style” versions of the 6 songs featured in the Trials of the Embers event. Basically, this means that they are “normal” and gimmick-free versions of the songs, with full sets of charts. That doesn’t make them any easier, though! Speaking of ways we’re going to top ourselves for Shrive, we would like to share a few of them with you. Tonight brings the symbolic end of the Gathering of Embers and perhaps its most famous moment, when the giant, wooden alicorn that had been silently overseeing the proceedings in Duskgem Basin, will be burned to the ground with much fanfare (and all but the most loyal participants will promptly begin clogging up the roadways trying to get out a few hours later, if they don’t stay around for the afterparty that is). While this event was meant to be an opportunity to let loose, the fact that your one-time enemy Obscurus Noctis is here, brought an entire DJ posse with her, and is planning to do something during the burn with the same, vision-altering magic she tried using on you at the EDM festival in Las Pegasus earlier, has cast a shadow on your visit to Duskgem Basin. At the same time, her friends seemed to be quite friendly; Eight Track was pretty chill, while Train Spot and Wave Rider rival you and Blast Furnace in the “Most Adorable yet Tough Looking Couple at the Gathering of Embers” category. But, there’s always a chance that they were just trying to gain your trust so you won’t be suspicious of Obscurus, or be tempted to meddle with her plans. You’ve learned tidbits about her abilities from a mysterious DJ known as the Diamond Diablo, but now it’s time to put the pieces together. Everything you’ve seen here, no matter how ridiculous, can successfully be justified as being art. For all we know, it could just be good, clean fun in the end. But you’ve only ever seen Obscurus play dirty, so you’re not wrong in being suspicious of her future actions. Apparently, diffraction glasses (which conveniently fit right inside your ski goggles) make it easier to see the visible signature associated with this specific magic, but you’ve been warned that they can cause you to see disorienting “visions” during the burn. You see how turning every point of light into a rainbow-colored star could be potentially nauseating at any time, but everypony keeps talking up their effects like something a lot more significant is happening. Yeah, something’s gonna happen alright, and they’re not going to need rainbow-tinted glasses (or questionable agriculture) to see it if Obscurus gets her way. Like Blast Furnace told you earlier, these may just be your trials. 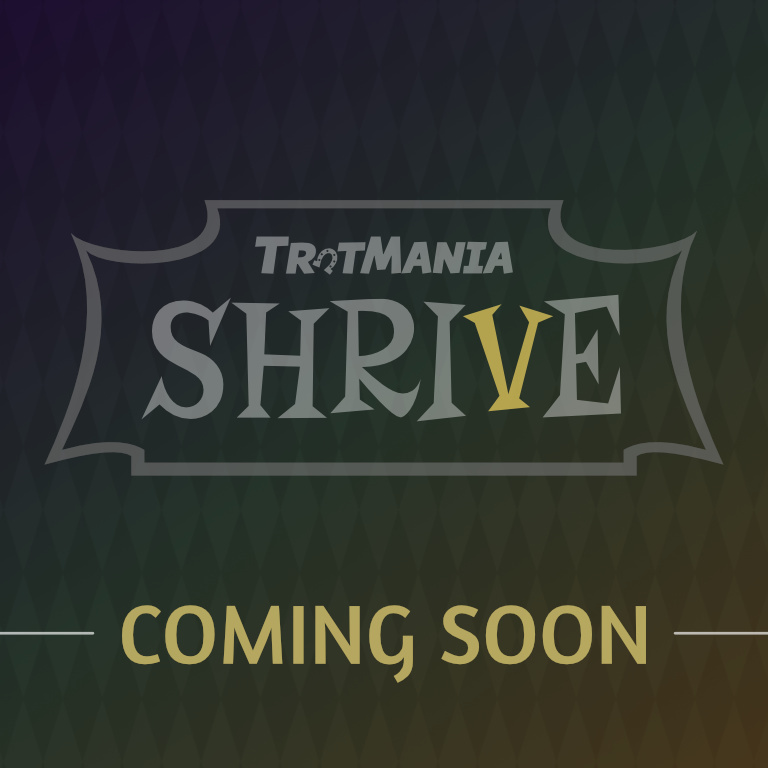 TrotMania III established a convention for having one of the final updates be accompanied by an event of sorts. While the update itself was the event in the case of Dawnfall, Trials of the Embers is an event in its own right, and is in my opinion, one of the biggest side-projects that has ever occurred within TrotMania so far. It was worth the wait, for sure. For those who aren’t aware, Trials is a set of missions in the style of those “sightreading tournament” things that people like TaroNuke have been organizing. That means gimmicks and lots of them. The Mod Lab stuff was just preparing you (and us, in a way) for this moment. These are brand new songs and brand new stepcharts that few people have seen before. Can you see through the visions and dance your way to victory? 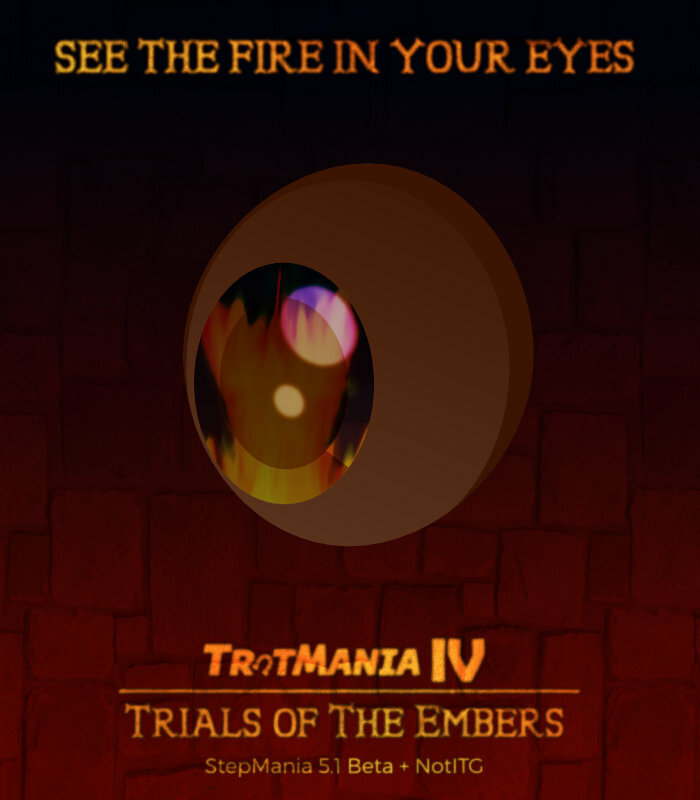 Trials of the Embers is set within the climax of the TrotMania IV story Embers Fall; the events will be seen from different perspectives in its final chapters, so stay tuned! As we have repeatedly warned, Trials needs a different version of StepMania than normal, because these songs utilize features not found in the current version. StepMania 5.1 Beta 2 was released earlier this week, and is the recommended version to play it on. A special Trials theme and a 3D version of the Horsegroove noteskin are included in the release bundle; you’ll only get the nice cutscenes/other art if you use the Trials theme. Speed mods do not matter. Keep it on an X-mod (i.e. 1.0x/1.5x), because the sequences specify their own speed mods, and we’ve seen M-mods cause breakage. Oh, and one more thing, you don’t need to worry about failure either: all of the stages are set up so that you can’t fail at all! Before we go any further, I would like to personally thank everyone who was involved in this little project; coders, troubleshooters, artists, etc. It took longer than I thought it was going to, but at the same time, this gave me more opportunities to add some final bits of polish and other surprises. While this is the grand finale of TrotMania Euphorius from a storyline standpoint, there is still one more payload update on the horizon, and we’ve also been picking up the pace on TrotMania V too! But anyway, Trials is what you’re here for, and the button below is how you will get it! If you need any help or want to show off your scores, we got a Discord channel for that. In any case, good luck! Payload 5 is Now Out! With our partners at PonyvilleFM celebrating their 7th anniversary, we thought it would be cool to give you guys the penultimate patch for our fourth title, loaded to the brim with tons of content! We continue work with our partners from Zenius-I-Vanisher in getting crossovers from the indie electro scene. Up first is BVG, a eurobeat artist whose rearrangement of a piece by former pony artist eXtaticus appears in the game with All We Can Do. Then there’s Quick Man, whose Talking to the Mirror provides some tense breakbeats to get your groove on to! Pound 131, bank pain, R3CTIFIER with Phoxi, and Silver Note all make their debuts in the series with Chaos Within, Empire Past, overwrite_deity, and Run respectively. PonyMania porting continues as DashStep by Baasik makes its debut in the TrotMania series. It is one of the harder standard bosses in the series, with a wicked level 17 Challenge chart to contend with! The final Pyrosentric bosses, Mutate and NIGHTWING STIMUL8R, along with the OMES YANDANCER, are now available for normal play! Almost all applicable songs in Euphorius now have lyric files which will display timed in-game, courtesy of newly appointed TM dev “\\”. The following new charts have been added: In Our Town (Challenge 15), J2R (Expert 14), Come Alive (Challenge 14), To the Sky (Challenge 11 (SA)), Entropy (Sim Gretina Remix) (Challenge 16 (SA)), Return (Challenge 17), In Our Town (Eurotopia Mix) (Challenge 16), Do You Love Me (Crystal Mix) (Challenge 14). Basashi has been altered significantly in terms of its cut and steps. Vinylicious is now credited to Scraton and its graphic set has been changed to reflect this. Spirit of Fire’s background script from the Mod Lab pack is now part of its normal version. Cloudsdale EVOLVED (all versions) has been cleaned up on Expert. Good Girl (Sub.Sound Remix) is now Good Girl (JoinedTheHerd Remix) and its graphics have been redone (in higher resolution!) to reflect this. Other minor improvements have been made across the board. The Mod Lab pack is now part of the main patches! Note that they have received minor enhancements since their individual appearance with the last patch, along with new previews to help differentiate them from their normal counterparts. The theme has also received its 1.5 update, which includes some fit and finish tweaks, the changes necessary to use the new Pyrosentric set correctly, as well as some, ahem, plot-related … things. The previous NoteSkin download has also been merged into the Theme bundle, and also has some new additions in the form of Equality2 (finally updated to match the appearance of the other noteskins as of TM4), and Horsemaniax. Note to those who have older versions of the TM4 theme; due to the changes and optimizations in this release, it is highly recommended that you not overwrite an older version of the theme with this one, and that you just delete the older version and replace it with 1.5.